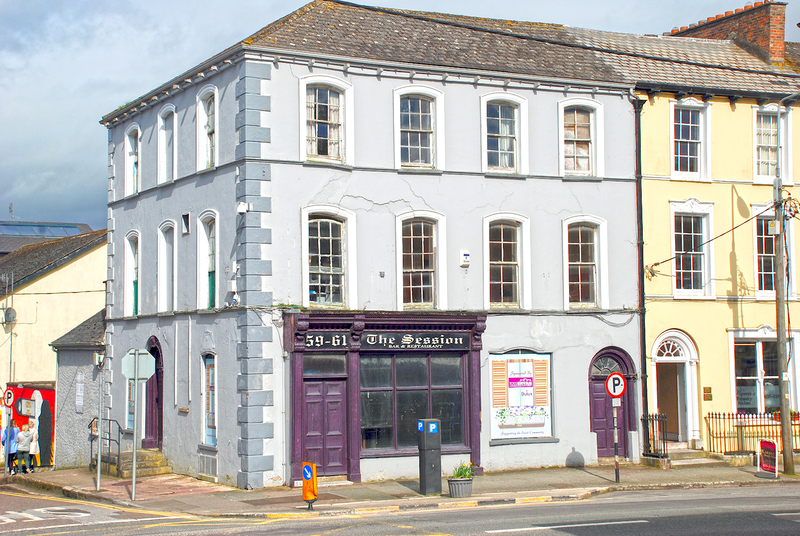 The derelict 59 Club at 59 Patrick Street Fermoy has been the source of concern locally, and particularly for the Fermoy Tidy Towns Committee who worry that the building will soon become a serious danger and that scaffolding will have to be erected which would be unsightly. The building which was built circa 1840, was first built as a house. The facade has a timber shopfront but has been disused for a number of years. In 2016, Fermoy Tidy Towns power-washed and painted the exterior and placed signs, sponsored by Toss Bryans, over the windows. The building is located on a prominent corner of Lower Patrick Street and Fitzgerald Place and it’s substantial and imposing size makes it a well known building in the town. The building is on the derelict sites list for this year and when contacted, Cork County Council said that the local authority ‘is currently following up on this matter in accordance with its powers as set down in legislation'. “I’m well aware of this concern and there are definitely health and safety issues there. I have made representations to Cork County Council on a number of occasions and they are monitoring it and are also concerned. "Hopefully it won’t come to a situation where scaffolding would have to be erected but health and safety has to come first,” Cllr Noel McCarthy who is chairperson of Fermoy Tidy Towns Committee, said.